If you have an artistic talent and an innovative drive, along with a solid knowledge of physics, calculus, and geometry then a career in architectural engineering may be an ideal fit for you! By obtaining your bachelor's degree in architectural engineering you will be prepared to enter the work force in the area of construction management, architectural engineering, or engineering technology. The first educational step is to obtain your high school diploma, or the equivalent. Your transcript, along with your ACT scores, will probably need to be submitted to the college or university that you plan to attend. Some colleges and universities will require that you also submit a few letters of recommendation. Your bachelor's degree program in architectural engineering will include numerous classes in humanities, history, art, design, and mathematics. You will also need to take courses that teach you about modern methods of construction, mechanical aspects of a building, electrical and lighting factors of a building. The course work for this degree program is designed to help students understand the concept of architecture and to also understand how to professionally communicate with others in the field. Of course, as with other degree programs, you will have to complete general education courses before beginning to work on the more concentrated courses that are more geared towards your major. This bachelor's degree program generally takes between four and five years to complete, depending on the number of math and science hours you are required to complete. After you have obtained your architectural engineering degree, you will have the knowledge and skills set needed to perform in the world of architecture. You will be responsible for working alongside civil engineers and architects to design structurally sound and visually appealing public buildings. While an architect's expertise focuses on the outside of a structure and its visual appearance, an architectural engineer works to design the internal portions of a building. For instance, your degree will make it possible for you to become an architectural engineer. An architectural engineer works to bring an architect's designs to fruition. This job will require you to be knowledgeable of structural systems, ventilation, building codes, lighting, and engineering forms. Or, you could choose to become an engineering technician. In this job capacity you would be responsible for conducting research, developing a design, and troubleshooting the production. If a job as a construction manager seems to appeal to you more then you will likely spend your days planning, developing, and coordinating specific construction projects. In this profession, you may own your own construction management business or you may work for a large corporation. Should you decide to further your level of educational degree, you will have additional employment opportunities that become available to you. In addition, you will choose an architectural engineering area to focus your studies on. 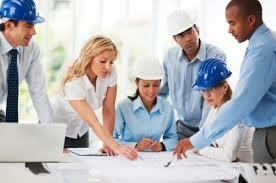 Typical areas of concentration are: housing development specialist, senior architectural engineer, or urban planning. While there is a shorter, two year degree program available in relation to architectural engineering, this degree program will not allow you to seek employment in very many areas. When you graduate with your Bachelor’s degree in architectural engineering from an accredited school you’ll now be ready to start looking for a job. One of the advantages you’ll have with your degree is it applies to so many different industries. Below are just some of the titles and industries you’ll find when you start researching jobs in your area. Don’t forget your first stop should be at the school you graduated at to sit down with a career services representative for job assistance. Often schools have good relationships with local engineering companies and can help you get an interview. According to the BLS the average salary for an architectural engineer is around $73,000 per year with the highest 10% of all employees making $116,000. The industry is expected to have a massive growth of 25% over the next 10 years which makes this a great long-term industry and career. - Work on multi-disciplinary teams. - Communicate and identify relevant issues and how they relate to architectural engineering. - Formulate solutions based on experiments and data. - Proficiency in building mechanical and electrical systems. - Analyze and employ technology using your leadership skills. - Have an ethical responsibility regarding political, safety and health issues.